BamBooBat Review | Why Use A Bamboo Bat? Want the softest feeling “wood” bat on the market? A BamBoooBat might be your best bet. The bat isn’t wood, technically, it is a grass. So, you’re not only saving the rain forest but you’re also getting a super smooth feel. The bat’s have a lot of give at contact with will make your hands and thumbs grateful—especial… Jump to the full review. We aren’t the only ones to have information about the . Other places, in particular those who sell bats, usually have a boiler plate write up on the specs of a bat. Many of those we reference to make sure we are seeing what we should be. Here are some more references for the BamBooBat review. A BamBoooBat might be your best bet. The bat isn’t wood, technically, it is a grass. So, you’re not only saving the rain forest but you’re also getting a super smooth feel. The bat’s have a lot of give at contact with will make your hands and thumbs grateful—especially on mishits. Bamboo is also remarkably durable. Of course the bats can break. But when compared to other “wood” bats this thing is a steel trap. In terms of a soft feel on a nearly unbreakable “wood” bat a Bamboo bat is the way to go. And, if you’re going Bamboo, why not buy it from the company named BamBooBats? Seems pretty straight forward enough. Throw in some pretty decent pricing across the board and a number of options (like a fungo) and you’re off to the races. There really isn’t anything comparable to Bamboo. Sure, You might find some sucess with an Ash bat–which run with a little more give than something like a Maple bat. But, in terms of how soft they feel on contact you just can’t beat a Bamboo bat in the “wood” bat space. There are, of course, other companies that make Bamboo bats instead of BamBooBats. Mizuno, among others, have a few options. Check the market on some major vendor sites with searches like this. 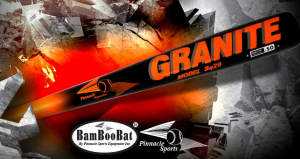 Are Bamboo Bats Legal for USA Bats? We discuss a lot about wood bats legality in our USA Bats pages. But, in short, bamboo is not automatically approved for Little League play. Wood bats are (Ash, Maple, Birch) but bamboo is not technically a wood but a grass. As such, a bamboo bat needs the USA Stamp to be legal. BamBooBat are made from, wait for it, bamboo. Bamboo, you probably know, is a grass and not a tree. In other words, it isn’t actually a forest your killing by trying to hit dingers. This also explains the relatively inexpensive nature of bamboo bats. The bamboo is laminated together and then formed into the shape of a bat. Throw on some polish and coating as well as a cool paint job or two and you have a whole host of bats in the BamBooBat line up. BamBooBats have a lot of different sizes. Some of their most popular models are their fungo line of bats. You can also find them in BBCOR sizes as well as a few youth models too. However, do note, USA Bats only allows single piece wood bats in their games without the official stamp. That makes bamboo (and BamBooBats) on the outs until can get the certification.